The iconic Apollo 8 image of our Earth rising over a barren moonscape taken in 1968 started the environmental movement by revealing the fragility of our home in the vastness of an implacable universe. 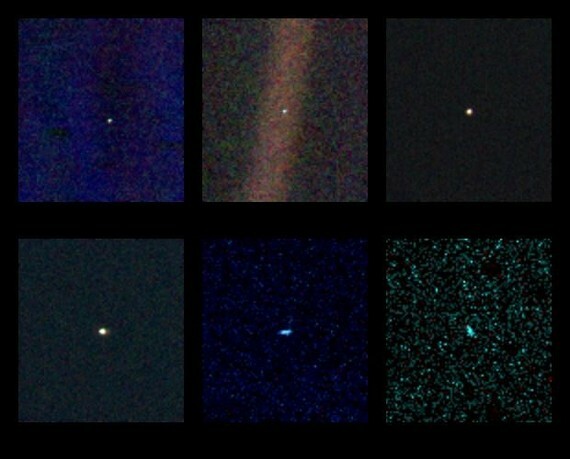 Recent images of Earth from across the solar system serve to remind us about the uniqueness of the Pale Blue Dot we call Home! This image was taken by Astronaut William Anders using a Hasselblad camera with a 3-inch lens. 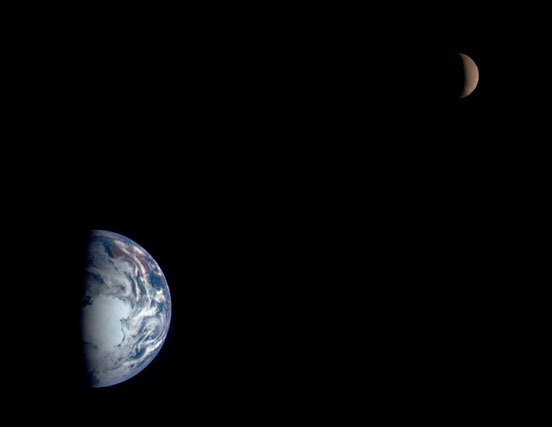 There are two vantage points in the solar system where we encounter two very different impressions of Earth from space. Across the inner solar system one can still see telescopic details of Earth as a disk of light with oceans, clouds and continents. But beyond Mars and the asteroid belt, Earth's myriad details quickly collapse with distance into a dot of light seen merely as a bright star. 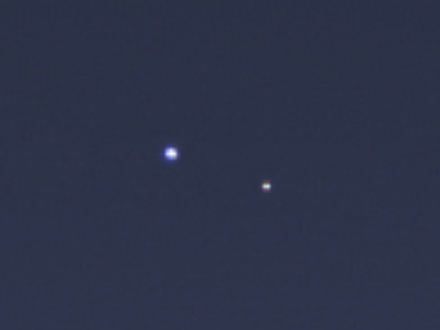 The NEAR spacecraft took this dramatic image of Earth and our moon from a distance of 250,000 miles as it prepared to embark on its journey to asteroid Eros. The high resolution camera easily sees cloudy details, the continent of Antarctica and a hint of brownish landmass of western Australia. Even hints of large craters on the Moon can be discerned. The NEAR spacecraft camera used 2- inch telescopic lens to see these details. Its angular resolution was about 20 arcseconds per pixel. The human eye by comparison is about 60 asec/pixel. One arcsecond is 1/3600 of a degree in angular measure. On this scale, the full moon is about 0.5 degrees or 1800 asec in diameter. From a distance of 4 million miles, the Galileo spacecraft snapped this image using a telescopic system with a 1-inch lens and you can still see many details. Again the Earth-moon separation is foreshortened making the moon seem impossibly close to Earth despite its 240,000-mile actual distance. Here the resolution is only 2 arcsec/pixel or about 10 times better than for NEAR. With a smaller camera lens only ¾-inch in diameter, the Juno spacecraft snapped this image from a distance of 5 million miles. 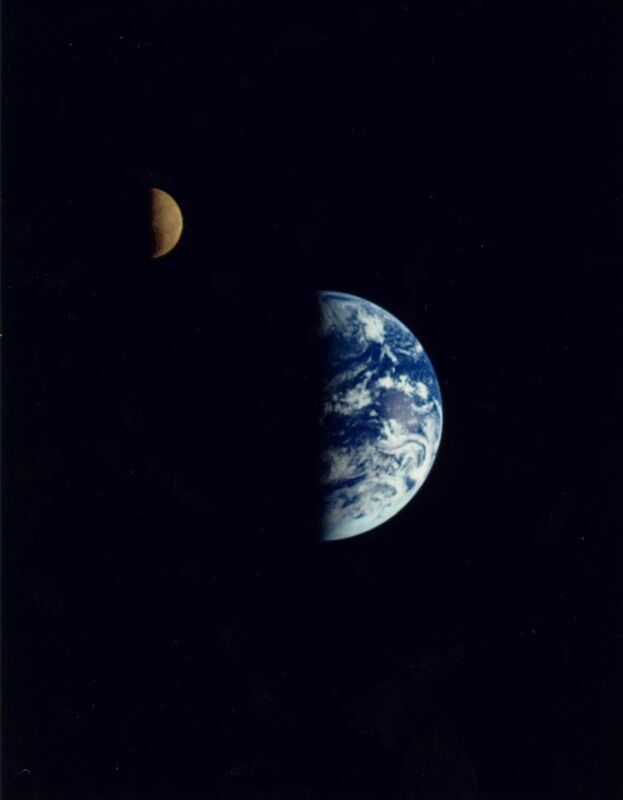 We now see Earth and moon at nearly their proper separation and can easily compare their relative sizes accurately. We can't see any details because such a small telescope only musters a resolution of about 700 asec/pixel. It is intended to study Jupiter as it orbits the planet for which this resolution is adequate to see details as small as 9 miles/pixel. A smaller aperture is also required because up close Jupiter is very bright. Even the MESSENGER spacecraft snapped a fuzzy image of our Earth as it headed for Mercury. The narrow-angle camera 1-inch lens can take black-and-white images at 5 asec/pixel resolution. This lets us see images of the surface of Mercury at about 15 feet/pixel from a distance of 100 miles. Mercury is so bright that the camera was designed to have a smaller lens, which makes it less useful for seeing astronomical objects like Earth. There have been many images taken from the surface of Mars of our Earth and moon, which appear as bright stars perpetually in the dawn or dusk skies, but the larger camera lens of the Mars Global Surveyor could still snap a high resolution image from 80 million miles away of a recognizable Earth. The blue oceans and white clouds stand out clearly, though with only a 6-inch lens there is not enough resolution to see any landmass details, let alone signs of life. The narrow-angle camera had a resolution of just under 1 asec/pixel. This lets it see surface details of 4-feet per pixel from an altitude of 200 miles. Beyond the orbit of Mars, and with the kinds of telescopic systems carried by current spacecraft, Earth becomes a mere dot of light in the sky. 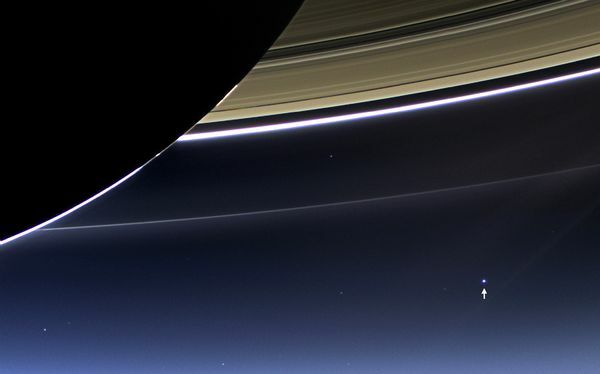 The Cassini spacecraft orbiting Saturn at a distance of 850 million miles showed us a glimpse of the Earth from the outer solar system. Here we lose any sense of Earth being a disk of light, and it now is merely another bright star in the sky with a diminutive companion star, our moon, never getting very far away. Occasionally we see it mingle with the rings of Saturn. The narrow angle camera has a resolution of 1 asec/pixel provided by an impressive 7-inch telescope. 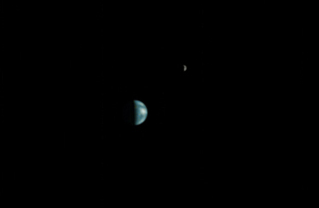 But the most amazing view comes from just beyond the orbit of Pluto where we see Earth as merely one of many unresolvable planets in our solar system in this 1990 photo montage from the Voyager 1 spacecraft using its narrow angle camera with a 7-inch aperture and a resolution of 3 asec/pixel. These images would have been impossible were it not for our detailed understanding of how the universe works. One of the more interesting features is that most of these spacecraft used radioisotope thermoelectric generators (RTGs) to create their electricity. These devices work by using the heat energy released by decaying plutonium atoms to generate precise amounts of electricity. If you get this calculation wrong, your spacecraft stops working before you reach any of the distant planets. Most RTGs use about 10 pounds of non-weapons-grade Plutonium-238, which decays with a half-life of 87.7 years. RTGs using this material will therefore diminish in power output by a factor of 0.787%, per year. For the RTG used by the Voyager 1 probe, after 38 years the radioactive material will have decreased in power by 26%. Starting with a capacity of 470 W, today the RTGs only provide 350 W. By 2025, operating at only 320 watts its RTGs will no longer supply enough power to run the spacecraft. The very same calculation lets us assign dates to Earth and space events going back billions of years from today using other radioactive materials like carbon-14 or uranium-235. If you are a Creationist your only choice is to deny that RTGs work and that these beautiful pictures of Earth directly challenge your worldview. Either that or God is a Trickster second only to Satan himself!